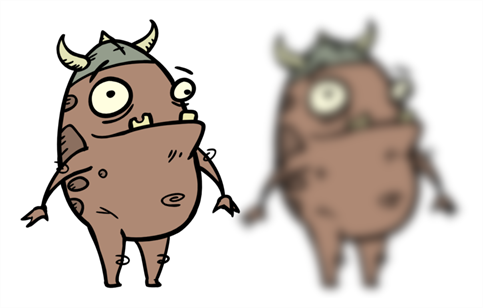 The Blur effect creates an effect that softens, fogs or obscures the image evenly in all directions. This effect is useful when you want to make cloudy images not realistically seen in detail, such as a drawing object that is farther back or in the background of your scene, usually blurry due to the laws of atmospheric perspective. Other uses include the general softening of objects such as snow, stars and shadows that do not naturally have a hard outline. Inverts the matte used to generate the effect. By default, the effect is applied to the opaque areas of the matte drawing. 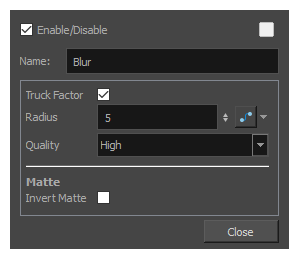 When this option is enabled, the effect is applied to the transparent areas of the matte instead.